McDonald's occupies a location on Water Street, a 0.35 mile distance west from the centre of Port Talbot (close to Scrap Yard). This restaurant primarily serves the patrons in the districts of Margam, Taibach, Baglan Energy Park, Cwmafan, Velindre, Aberavon, Caerhendy and Port Talbot Town Centre. All through today (Thursday), its hours of operation last for 24 hours. Please review the specifics on this page for McDonald's Port Talbot, including the working hours, restaurant address info and customer feedback. McDonald's is set immediately near the crossroads of Afan Way and Water Street, in Port Talbot, West Glamorgan. Just a 1 minute drive time from Heilbronn Way Roundabout, Corporation Road, Isaac's Place and Enfield Street; a 5 minute drive from A48 / Pentyla Baglan Road, Ffordd Yr Harbwr or Junction 41 (Pentyla) of M4; and a 12 minute trip from Victoria Road Roundabout and Junction 40 (Taibach) of M4. If you plan to access this restaurant by Sat Nav devices, please use the postcode SA12 6LL. Customers should alight at Port Talbot Bus Station. Get a train to Port Talbot Parkway Station (2480 ft) or Baglan Station (1.88 mi away). Easily accessible via the Arriva Trains Wales line. Just a short walk away you'll come across Phoenix Wharf (Disused), Neath Port Talbot Hospital, Port Talbot Steelworks, Saint Paul's Church, Aberavon Rugby Football Club and Research & Development Village. McDonald's runs 1 branch within the Port Talbot, West Glamorgan area. 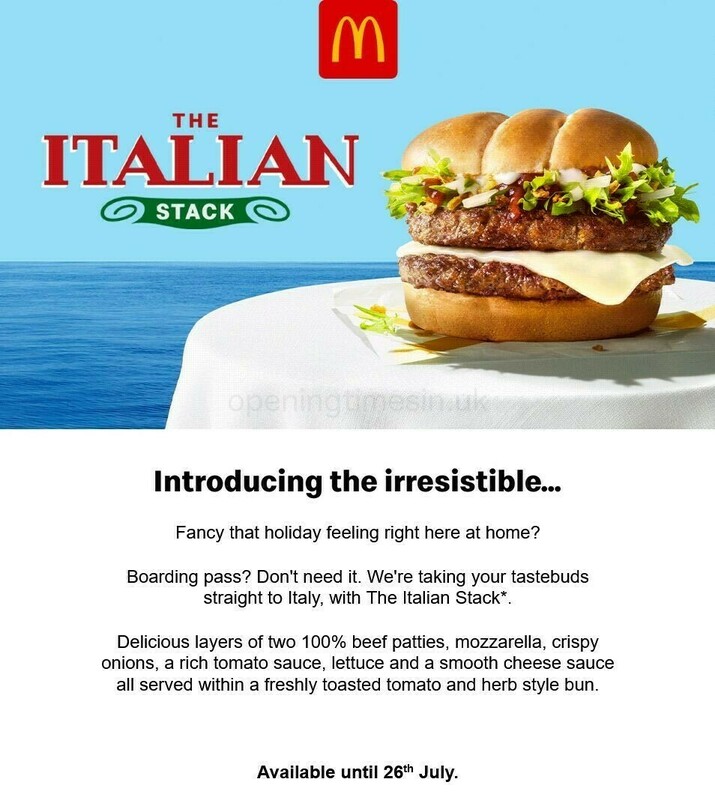 Click here to open a full index of all McDonald's branches near Port Talbot. Please note, usual opening times for McDonald's in Port Talbot may shift during the holiday season. For year 2019 it pertains to Xmas Day, New Year's, Easter Sunday or Black Friday. The best way to get verified details about seasonal operating hours for McDonald's Port Talbot is to go to the official website, or phone the customer service line at 370 524 4622. The Opening Times in the UK team strives to supply you with the most accurate information as possible. Please use this form to report any mistakes with the location info or restaurant hours for McDonald's in Port Talbot. Please express your thoughts about McDonald's by posting your review in the form provided below. You may also rate the location by using the star ranking system.